The dates of the two events organized by Parma Karting at the Circuit South Garda of Lonato: the 25th Trofeo Andrea Margutti will take place next 28-30 March 2014, while the 43rd Trofeo delle Industrie next 7-9 November 2014. The two classic and traditional events organized by Parma Karting Asd have now a date. 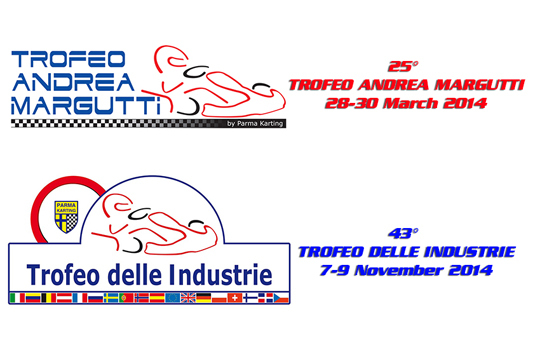 The 25th Trofeo Andrea Margutti will take place from 28 to 30 March 2014 and the 43rd Trofeo delle Industrie will go live from 7 to 9 November 2014. Both races will be held at the Circuit South Garda Karting of Lonato (Brescia, Italy) and are open to the categories KZ2, KF, KF Junior and 60 Mini. All the races will be part of the International CIK-FIA 2014 calendar. The Trofeo Andrea Margutti will reach its 25th edition in 2014 as the first edition of the race took place in 1990. This important anniversary will be celebrated with several initiatives to remember the early passing of the young Andrea Margutti, driver that was competing against Giancarlo Fisichella, Jarno Trulli, Danilo Rossi and several other champions. The 2013 edition of the Trophy had 200 drivers on track from 26 different countries. The victories of the Trofeo Andrea Margutti went to Kristijan Habulin (HR) in KZ2, to Dorian Boccolacci (F) in, to Daniel Ticktum (GB) in KF Junior and to Domenico Cicognini (I) in 60 Mini. The Trofeo delle Industrie will celebrate its 43rd edition and is currently the oldest karting race in Italy. Born in Parma in 1971, the Trofeo delle Industrie has a long history featuring the participation of a lot of champions like the first winner Gabriele Gorini, Corrado Fabi, Ivan Capelli, Stefano Modena, Gabriele Tarquini, Alessandro Zanardi, Jarno Trulli, Giancarlo Fisichella, Danilo Rossi, Lewis Hamilton, Danil Kvyat and a lot of other important names of the International karting. The race will also award the absolute Trophy Memorial Carlo Fabi that had 140 drivers on track from 21 countries in 2013. The latest edition was won by Davide Forè in KZ2, while the other victories went to Callum Ilott (GB) in KF2, Alexander Vartanyan (RUS) in KF3, Nicola Abrusci (I) in 60 Mini.